So maybe I think I'm a little bit cool.. but it's probably just the pants. Look 5 of my favorite pieces from The Addison Story spring collection features this really cute sheer blouse and some badass accessories. If I've yet to express my love of skulls and studs with you guys, here it is. I'm always wearing at least 3 skull pieces on my hands or neck, ask anyone who knows me they'll tell you it's true. The McQueen bangle was a birthday gift from my hubby, what a guy. Wearing: The Addison Story Dress | Kelsi Dagger Booties | Pinky Yotto Jacket Are you not dying over this look!? The hight the heels that dress! I literally look like a fashionable sky-scrapper... ha kidding? So you can see I'm kinda excited about this look and that's because when I saw this dress in the showroom I said "no way Jose I cannot pull that off." With a little added edge and a personal style touch I think it looks pretty freaking awesome.Took this look for my new banner, what do you think?! So this is definitely my favorite outfit I've worn in a while. From the colors to prints to cutouts and that small ruffle detail, it's close to perfection. And hello, have you seen how great this roof is? I live on the 9th floor, and we only have 9 floors in my building, so the roof is right above me. I've been finding it so nice to walk up there and take a "time out" from my busy day and clear my head. Which brings me to a suggestion for all bloggers out there - staring at your computers for way too many hours without taking a break is SO NOT the way to go. IFB recently did an article on 10 Secrets of Super Productive Style Bloggers that has some other great tips too. Also - by the time you read this I'll be on a plane to ARUBA, yes! So even though this look kind of goes against my personal style, I freaking love it. I never go for that girly "pretty" look, but the colors on this dress were just too amazing to resist. I mean I did put some armor on (using my cuffs) just to add a little edge. How sick are these pictures though?! Today I am so crazy busy packing for Aruba and doing some last minute shopping. On my list is the new Zara flagship store and H&M for some inexpensive bikinis. Ugh bikinis, not sure if I'm beach body ready just yet. So guess what, I'm going to ARUBA this Thursday! Be jealous, very jealous. ALSO - I've recently hit over 20,000 followers on my new favorite app Pose. It's basically instagram for fashion but better! So if you haven't downloaded it - do it! And, follow me @weworewhat. Finally! My roof has been fixed and I can have all the access I want to a 360 view of downtown Manhattan. For the next few days I'll be posting a series of pictures I took featuring pieces from The Addison Story Spring collection. This was actually the last picture I took this day and so of course my trusty side-kicks jumped in for a few shots. You've met Kelsey before from Fashion Ace, and this is Freddy from Blue Perk who has been taking many of my pics lately. SO this is us, being us. Oh how I love these friends of mine. Big things are happening in this apartment guys, but it's all hush hush right now. The other day I spent my morning brain-storming with my partner in crime, Rebecca Zhau. Work breaks were taken on her incredible lower east side rooftop, and of course the weather was perfect. Had a really fun photo shoot today on my roof and I can't wait to share the images with you guys soon! Enjoy the weekend. Yes, I just realized I'm wearing a full Walter Baker outfit, and no, this was not done purposely. I really am obsessed with these leather shorts I bought a while back, and this swingin' top is brand new! The shorts are literally a shorts version of my favorite leather pants I wear all the time (maybe too much). I was feeling the black and white combo yesterday especially with this large-and-in-charge skull tote from RM. My friend Leah introduced me to Jack's Coffee Shop in the West Village and I tried it yesterday for the first time, very delicious. That's all for now, busy day/night ahead. Wearing: Rae Shirt Dress | Vintage Vest | Dolce Vita Booties | F21 Cuff - SimilarEven though it's a not-so-sunny day, Spring is still officially here and I couldn't more excited! Finally, an excuse to bare all, kind of, and it's definitely time to for a much needed tan. Good thing I'm going to ARUBA next week! I'm not one to wear dresses but this shirt dress from Rae seemed like it could still fit my style well. Challenge 4 of the Refinery 29 contest has just been posted so go check out my feature on BONDHardware here. And cross your fingers for me, hopefully I win! So today I am super excited to introduce you guys to one of my favorite new flash sale sites - PLNDR - an exclusive members only boutique that hosts limited time sales of brands from a site you may all know, Karmaloop. I'll be hosting giveaways and contests featuring items from their site pretty often now, and will be wearing lots of their awesome clothes. SIGN UP if you know what's good for your wallet, because PLNDR is very affordable. If you haven't guessed it yet, this adorable aztec skirt I'm wearing came straight from PLNDR (sorry you missed it). The old "no white after labor day" rule is long gone in my books. With the weather being as nice as it has been I'm feeling daring enough to wear all white, even with my morning coffee and newly discovered clumsiness. Side-stripe pants have been a favorite of mine recently, especially this pair that fits in with the pajama pants trend too. You might have noticed this BarIII spiky cuff that I've worn a few times now, it's one of my most dangerous jewelry pieces considering I always end up scratching people around me - but I don't care because it's really cool. Anyway, busy week ahead and hopefully lots of new outfit posts for you guys. Happy Monday! 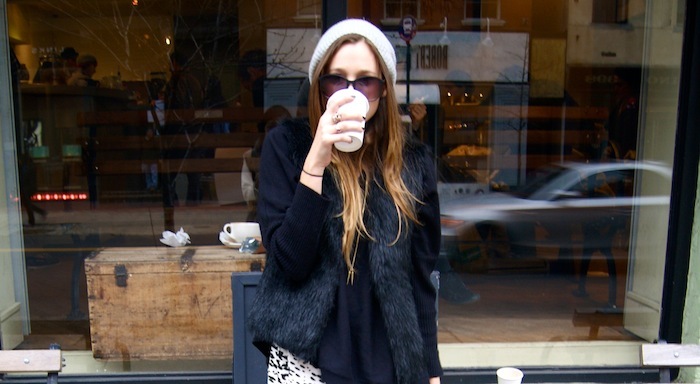 Wearing: Walter Baker Pants | Vintage Fur Vest - Similar | Topshop BootiesOutside Ground Support, one of my favorite Soho coffee shops that serves a really yummy chai latte. Poor Izzy got tangled on her leash in an effort to try my drink mid-blog-pics. Happy Saint Pattys Day everyone! Don't drink too much and end up as "that guy" with writing all over your face.